Your first step is to restart the mail client. See if it works then. If not. 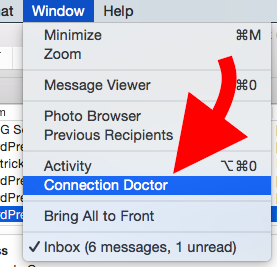 Go to the Window Menu and click “Connection Doctor”. A new window should open, checking all your settings. 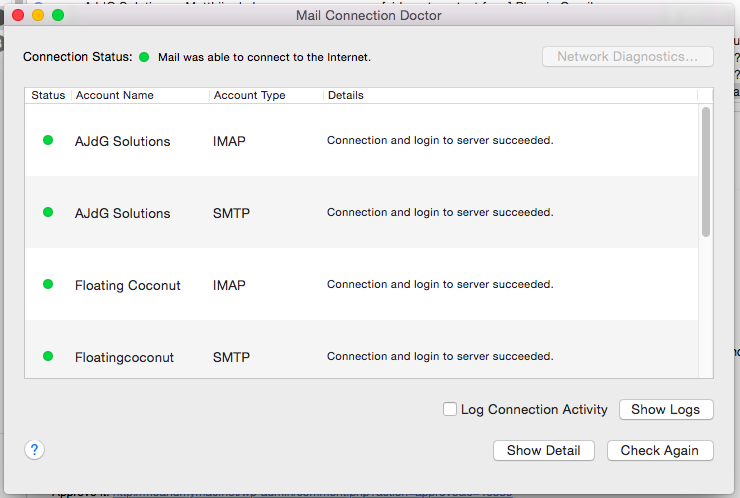 Connection doctor lists all your email accounts 2 times, one for incoming (IMAP/POP) and one for outgoing (SMTP) email. In the above example I deliberately broke one account – It’s marked with a red dot and the error with the likely cause is displayed behind it. This means I have to check my login details and verify the username and password. In my scenario the password is missing. When I add it in settings and check again everything shows green. 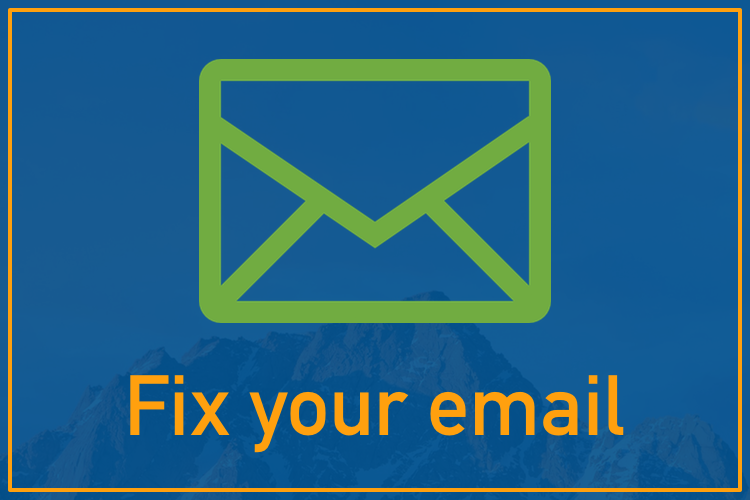 Of-course once we know what’s wrong with the email settings. I can go into settings and make adjustments to fix the issue. In my case something with the username and password. 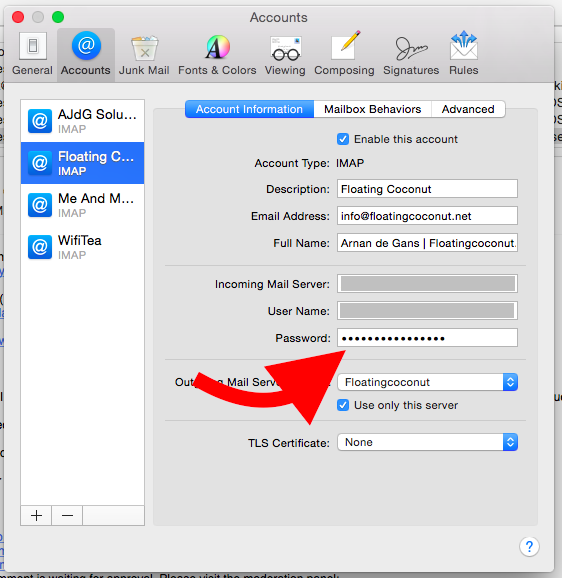 Review the screenshots below – And especially the items marked with a red arrow which are important for a working mail account. Reach these menus via the Mail > Preferences menu. If you receive your email on multiple devices you should try to avoid POP3. 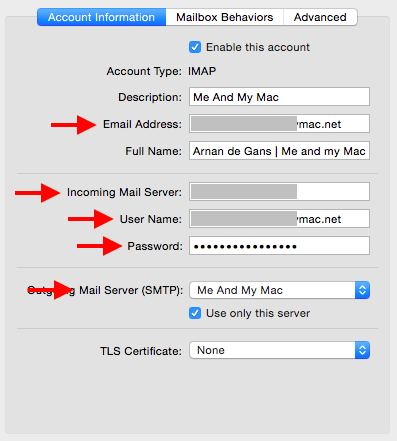 IMAP will sync your email via the mail server to all your devices. POP3 can not do that and will download emails on the device that asks for them first. Leaving the other devices without those emails. 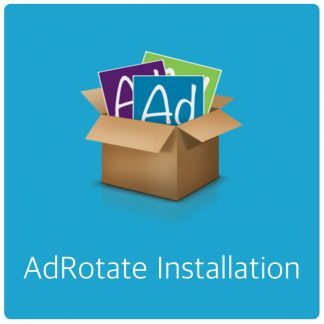 Having an asynchronous email setup like that is very inefficient and works very annoying. You never know where your mail is. 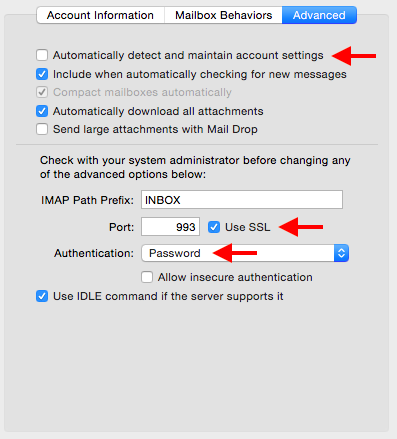 Most providers support IMAP these days. 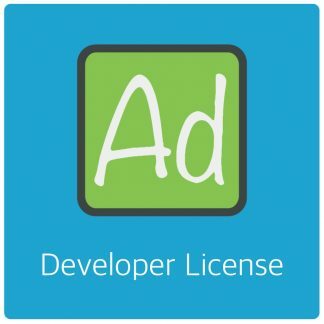 So if you can, ditch POP3. 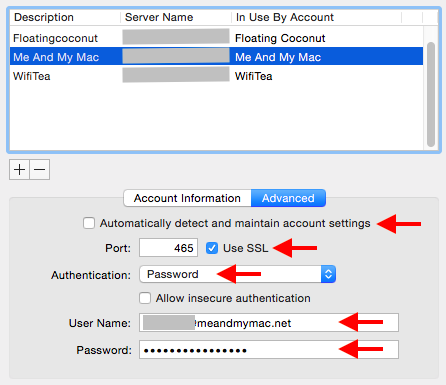 Equally important, always use the secure option. This is especially true if you regularly communicate with customers and such. It just adds that extra bit of security. 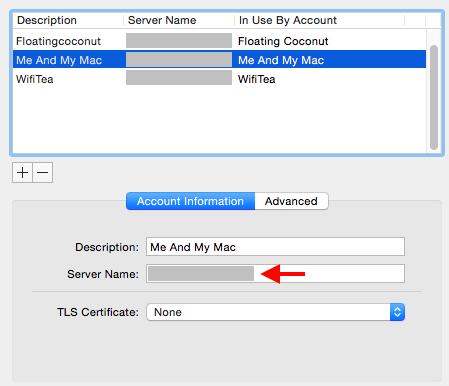 Check with your email provider if this is possible – Most support this too these days. 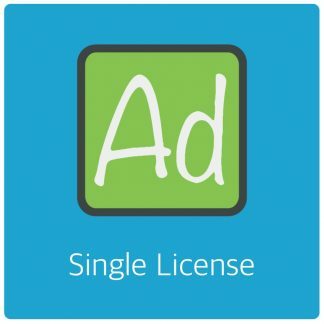 Sometimes for a small fee. Using it your email is encrypted end-to-end so nobody can snoop around and you can feel more comfortable sending eyes-only information. Saving the settings is done by either moving to another tab (top), selecting another account (left sidebar) or closing the settings window completely and confirming at the prompt. Note: This post applies to pretty much every recent version of Mac OS X. 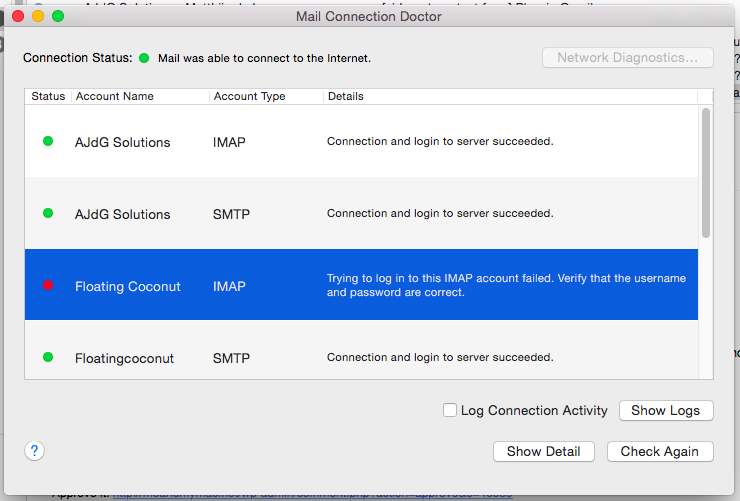 So Tiger, Leopard, Snow Leopard, Lion, Mountain Lion, Mavericks, Yosemite and El Capitan *all* have the connection doctor tool. Probably older versions too.